North American cratons and basement rocks. 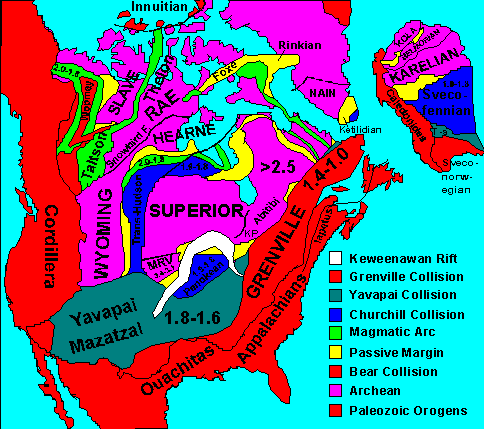 As radiometric ages were determined for the shield-like rocks on the continents which were either exposed at the surface, underlay the flat rocks, or were within the interior of the mountain belts, patterns of age intervals were determined. These old rocks have been called the "basement". This has been interpreted to mean that the continents had somehow grown by development of rock assemblages with these characteristic age parameters. The expanding continental nuclei are part of the "craton" which consist of both exposed and buried basement rocks. Originally uploaded by User:SEWilco as Image:North america basement rocks.jpg. Replaced when this better version found.